Southern Equine Service offers the state of the art diagnostic imaging modalities. We have digital radiograph machines so that we can quickly diagnose any bone injuries. Radiographs image bone and show any abnormalities in the bone such as bone spurs (osteophytes), dense bone (sclerosis), softer bone (lysis) and allow the joint spaces to be evaluated. All our machines are portable so we can take radiographs at our clinic or at your barn. Ultrasound is the imaging modality of choice for soft tissue injuries. Ultrasound is a two dimensional real time imaging modality that evaluates size, shape, and morphology of tendons and ligaments. Our machines are all portable and are current digital technology. MR Imaging is the gold standard to evaluate bone and soft tissue injuries. The cross sectional views of the affected anatomy in multiple planes provided by MR imaging provide superior detail of the soft tissue and bone. Southern Equine Service provides an in house 0.31 Tesla High Resolution MRI unit. If interested in MRI services please see our Client Portal. Nuclear Scintigraphy (Bone Scan) is a very sensitive way to look for areas of inflammation in the musculoskeletal system. It allows us to internally examine from head to tail, including the neck, back, pelvis and limbs and to detect problems which we may not be able to locate in any other way. Bone Scan can detect fractures early before there are any x-ray changes. It can be very useful for subtle lameness or performance problems. 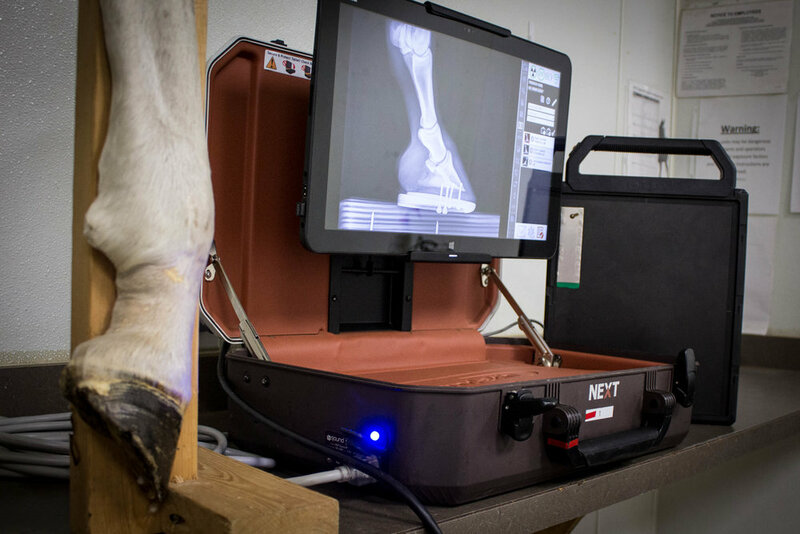 We possess a nuclear scintigraphy unit, more commonly known as a “bone scan,” to aid in diagnosing your horse. We use bone scans commonly for horses who have an intermittent or very subtle lameness, for overall poor performance that is hard to target, and ESPECIALLY for horses who have issues in areas of their body that are difficult to radiograph or ultrasound, such as the back, the pelvis, and the sacroiliac region. Our patients are standing and mildly sedated for the procedure, similar to how they would be for joint injections. We inject a radioactive dye into the horse with a single IV injection. We evaluate the blood flow, then the soft tissues such as tendons and ligaments, and finally we can evaluate the bone. In the simplest terms, the dye travels to where the problem lies, which we term as a “hot spot”. These hot spots are clues to diagnosing your horse’s lameness. The radioactive dye is not dangerous to the horse and is simply excreted in the horse’s urine by the next day. After the dye has been excreted and the horse is no longer radioactive (24-36 hours), our patient is returned to your care. If you are interested in a bone scan for your horse, or would like to discuss your horse’s case with one of our veterinarians to determine if he or she may be a good candidate for a bone scan, please see our Client Portal.